Address: De la Creu Blanca, 9, L'aldosa (La Massana), Andorra. Set in the heart of the Pyrenees, Hotel del Bisset provides the perfect ambience for a family holiday in the mountains. 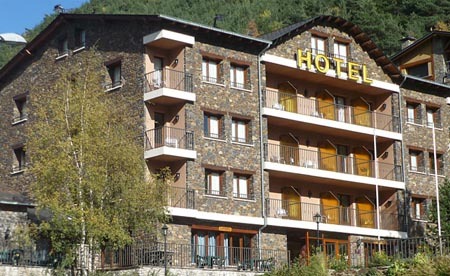 Hotel del Bisset is located only 2 km from the village of La Massana, and 6 km from the capital of the principality of Andorra, Andorra la Vella. It is very close to 3 top ski resorts, so is the ideal accommodation for a ski holiday in the winter season. Enjoying panoramic views of La Massana valley, you can admire the fantastic sunsets from this hotel. Each of the rooms in Bisset are exterior facing and equipped with TV's and en-suite bathrooms. An wake-up service is also available. Finish the day by dining in the on-site restaurant, which serves diverse cuisine, then retire to the bar-lounge area - with fireplace and a large terrace.